Former women’s Bantamweight champion Holly Holm will square off against Cris “Cyborg” for the Featherweight strap in UFC 219’s pay-per-view (PPV) main event from inside T-Mobile Arena in Las Vegas, Nevada on Saturday, December 30. In the co-main event, Khabib Nurmagomedov will squares off with Edson Barboza in what should be a Lightweight title eliminator, and Cynthia Calvillo attempts to continue her rise against former champ Carla Esparza. 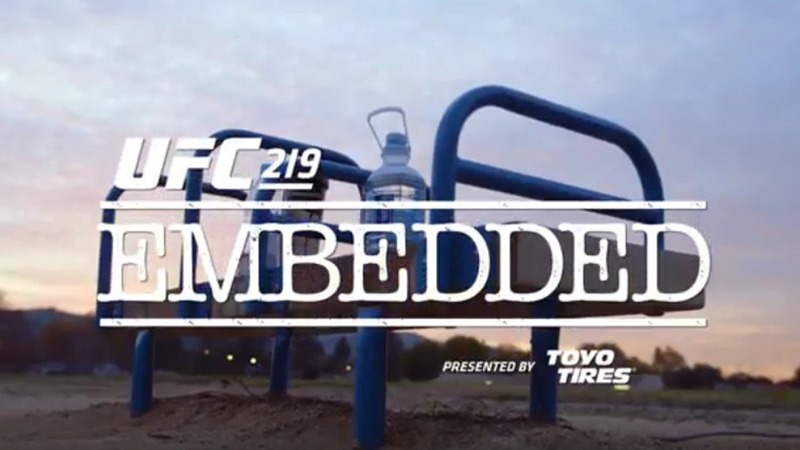 In the second episode of “Embedded,” Lightweight Khabib Nurmagomedov runs at a public park in San Jose and meets with a fan, as Opponent Edson Barboza brings his wife and son to the gym with him for motivation. Holm faces the final day of tough training at Jackson Wink MMA; featherweight champion Cyborg embraces a challenge at CrossFit. Former champion Carla Esparza and opponent Cynthia Calvillo working with their respective teams. Next articleVideo: Gabi Garcia only misses weight by a mere 26 pounds, is our fav freak-show fight in jeopardy?